In the online gain of first-person shooters, any edge one can get over another opponent that gives an advantage is fair game for most. Some FPS players will play a single map over and over again exploring every nook and cranny, every vantage point, and sight-lines for the best way to score on other players. Others will use more physical tactics such as faster responding controllers, higher-end computers, tweaks to the console, and the fastest connection available. There's also some black hat methods that, while looked down upon by most players, do give it distinct advantage, at least in the short term. They also have a greater disadvantage because they're most likely to get reported and kicked off the server, or avoided by other players. Most of these white hat methods, and black hat methods, require significant expenditure in time or money, sometimes both. It is rare to find a tweak that will produce significantly better results in FPS games without that. However we recently come across one such product is impressed us with both the simplicity and effectiveness. That product is Kontrol Freak extenders for game controllers. These extenders simply fit over your control thumb sticks, giving you both a better grip and control over the stick movements. They work much like a lever to move a large rock. The longer the lever, the easier it is to move the boulder. On nearly all control sticks there is a bit of inertia moving from the home position to a new position in any direction. And on some controllers there's even a bit of dead space before the movement is registered. With the control freak extenders in place, both of these conditions are overcome more easily than with the standard configuration. The result of this is, with a bit of practice, a significantly higher bit of control. "Having used the Kontrol Freek extenders for a couple of weeks, playing it online 4 or 5 times for 2 to 3 hrs each time, I am impressed with the fit over the Xbox 360 and Xbox one control thumb sticks. They fit snug and tight, but they can come off with very moderate effort so it was easy to get back to your original controller thumb stick or change to a different extender. I can't confirm this, but if you changed them out a lot, I feel that they may get looser fitting, only more time on them can really answer that question. The top thumb pads on the extenders come in either convex or concave. I mainly used the convex tops because the concave were a little taller and felt a little awkward. I did not spend much time with the convex ones and feel that they might be better for a different game other than the FPS I typically play. 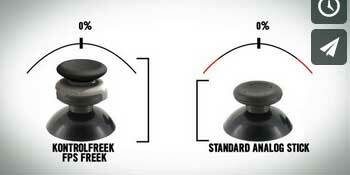 The Kontrol Freek's thumb pads do have a nice non-slip grip to them, especially after a little use. As I understand it, the idea behind them is greater leverage and range of motion. I really tried to find a way to measure this and the motion takes a little to get use to at first. I had to slow down my look speed and then adjust it back up as I got use to it, otherwise trying to aim was all over the place. Playing in the FPS games with the extenders, I have seen a increase in my K/D ratio. I do not notice much advantage in the actual aiming because I think the game itself has its limitations, but with what is called scoping, I seem to have a better result. I want to continue using the Kontrol Freek as I do like the results. And I like the fact that it is not a mod that takes skill out of the game. I understand it is tournament legal. " Having played against Elite MrDave ourself, any further advantage these extenders have given him definitely mean more trouble for us. All in all we found it pretty amazing that something as simple, and inexpensive, as these control stick extenders. Costing anywhere from $10.99 up to $13.99 guarantees that they have definitely found a place within our gaming armory. EDITOR'S NOTE: This was a previously published review back in February 2014 that was lost in a server crash, and is now back by popular demand. Thanks to all our guests for visiting and giving us feedback!